Power your new build with this Seasonic M12II Bronze 620W Modular Power Supply. Sea Sonic Electronics launches the M12II Bronze Series, the new and upgraded version of the M12II Bronze Series in response to the growing demand and anticipation for more energy-efficient products. The M12II Bronze Series inherits the same output and wattage options as well as the superb quality and ultimate silence from the M12II Series. The M12II, available in 500 watts, offers buyers with a mid range power output solution with cable management, to meet their exact system needs; cable management is now made easier than ever. The M12II Bronze Series achieves the 80 PLUS?? Bronze standard of at least 82%, 85% and 82% efficiency under 20%, 50% and 100% operating loads respectively. Combined with Active Power Factor correction (Active PFC), the M12II Bronze reduces energy waste, boosts power efficiency and more importantly, helps the users to save energy and reduce electricity bill. While upgrading in efficiency, the M12II Bronze Series maintains the advanced designs and quality components from the past M12II line. Such designs and components including Double Forward Converter design, Smart and Silent Fan Control and highly reliable Japanese brand capacitor also boost the overall performance in stability and silence. 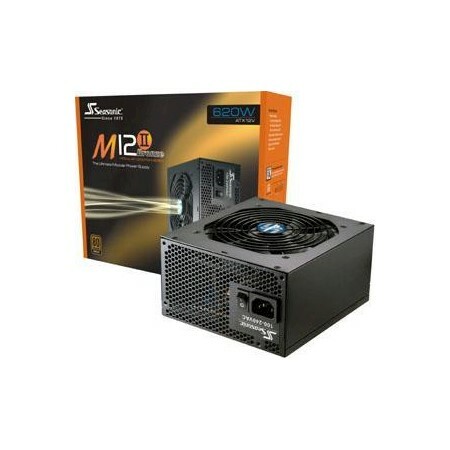 The M12II Bronze Series is available in standard ATX Form Factor and in wattages that are beneficial for a PC system. With the all-in-one cabling design and EPS connectors, the M12II Bronze Series is geared to support IPC and server systems and as well, both 6P & 8P PCI-E connector for latest and high end dual graphic cards. Moreover, the modular design also provides a flexible solution for orderly cable management. The M12II Bronze Series is made reliable by featuring safety regulations such as Over Voltage Protection (OVP), Short Circuit Protection (SCP), and Over Current Protection (OCP). Major safety and EMC directives and as well, the environmental certifications RoHS and WEEE increase safety and usage reliability for the users. Total protection for your power supply, your system and yourself. Operating temperature: 0 to 50??C. Relative Humidity: 20% to 80%. Relative Humidity: 20% to 80%.